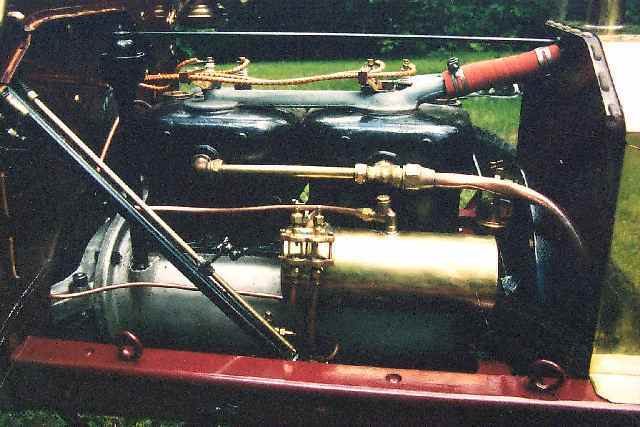 The engine of the Model N is quite different from the later Model T's. The cylinders were cast in pairs, machined, and bolted to a crankcase made of cast aluminum. 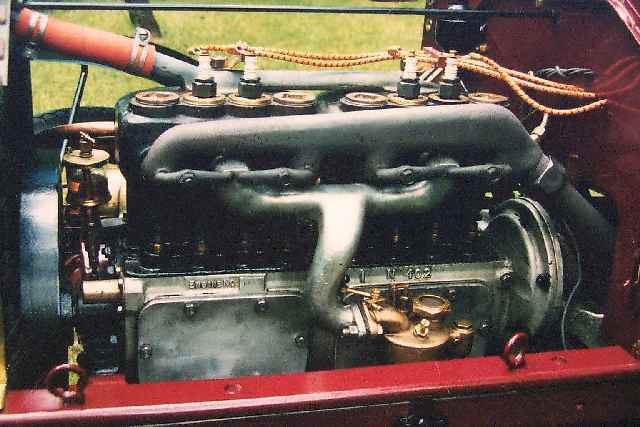 The manifolds and carburetor are located on the left-hand side of the engine. This may have been done to allow the steering gear to clear the carburetor. The flywheel is located at the front of the engine (on the right hands side of the photograph). It was designed with blades so that the flywheel would also serve as the radiator cooling fan. The engine is lubricated by the splash system. However, oil leaks out of the engine at a rapid pace. 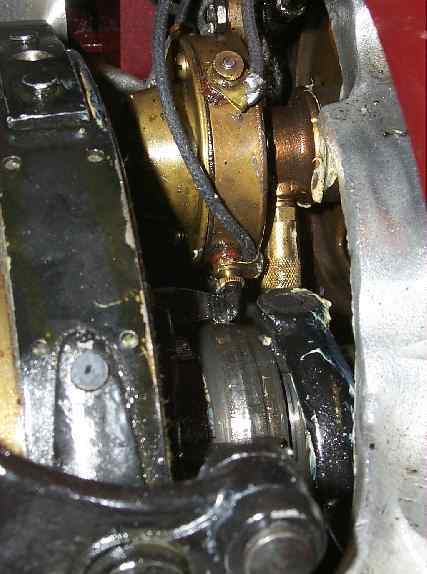 To replace the oil that leaks out an oiler is attached to the right hand side of the engine. This is a a pressure fed oiler that is powered by exhaust gases via a copper tube that runs from the rear of the exhaust manifold to the oiler. There are two output lines from the oiler. One runs to the crankcase, the other extends to the rear of the transmission to oil the rear transmission support bearing. The large diameter brass tubes that can be seen above the oiler carry coolant from the water pumpt to each of the pairs of cylinders. The bane of a Model N owner's existance is the timer shown in the above photograph. The Model N's timer is located in one of the most inaccessable locations on the car: at the rear of the camshaft between the engine and the transmission. To make matters worse, the exhaust pipe is immediately to the left of the timer. If the engine has been running for any length of time, it is nearly impossible to reach the timer because of the heat from this pipe. The timer is so hard to reach that it is necessary to remove the rear axle and disconnect the engine transmission from the engine to remove the timer. The timer is lubricated by a brass oiler on the bottom side of the timer. To add oil to the lubricator it is necessary to disconnect the spark rod from the timer in order to twist it far enough over to reach the oiler.